Jerry Seinfeld has a popular online series called Comedians in Cars Getting Coffee whereby he invites other famous comedians to ride around town (mostly L.A.) in a fancy automobile très à propos for his guest. Then they stop and have coffee. While this region does have it’s fair share of fine comedians, we also have a great collection of architects with an appreciation for various buildings within our metropolis, so I came up with this mini series called Architects on Bikes Checking out Buildings. I will be asking various members of the profession to choose three edifices within the region that they admire, then I’ll plot a safe bike route to each one and go check them out. My first guest is Susan Smith Architect, who designed our third floor studio addition. 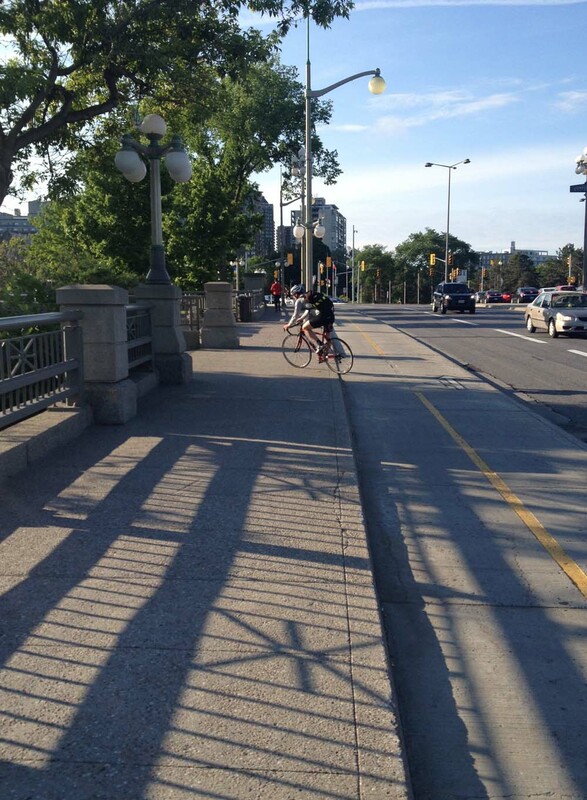 Not only is she a fine architect, she has also spent her entire career in Ottawa sans automobile(! 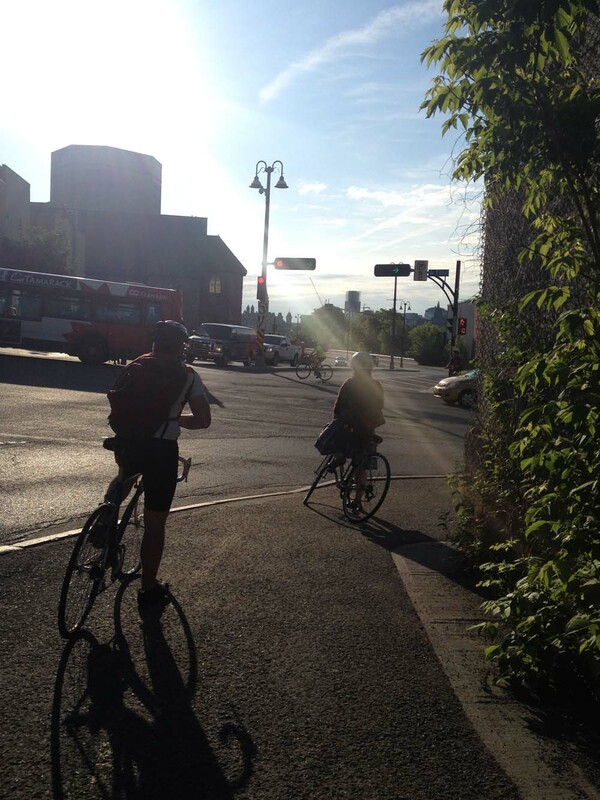 ), using her bike and public transportation since graduating from Carleton University School of Architecture many moons ago. She’s also a stellar older sister. We headed off early Saturday morning and checked out her picks. 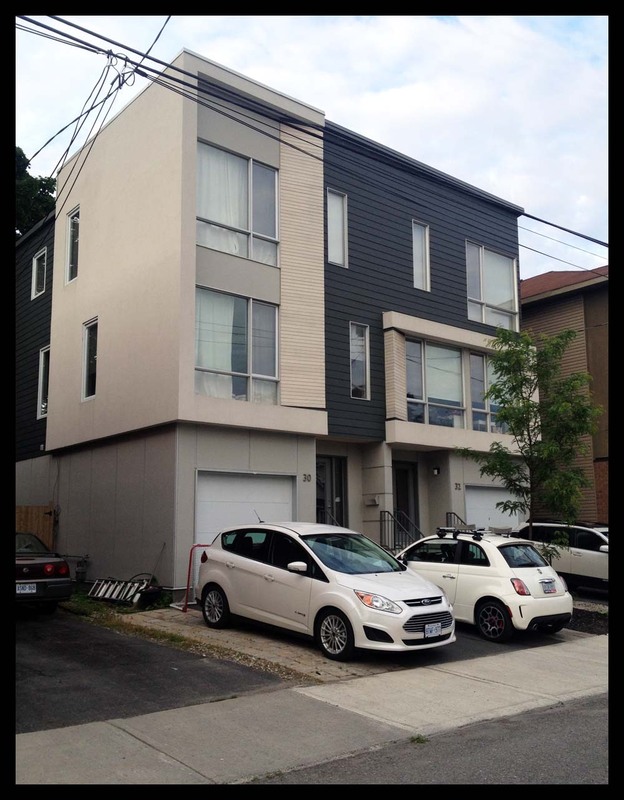 First stop: 30 Sims Avenue in Hintonburg, where sits this new house. Sue noticed it while biking to her office nearby on Gladstone. She appreciates it’s elegant simplicity and detailing. New house on Sims Ave.
After admiring this little gem of a dwelling, we bicycled over to Dows Lake and along the Rideau Canal Western Pathway, then cut across the Golden Triangle to get to Sue’s second choice: The elliptical Public Service Alliance of Canada Building, completed in 1968 and designed by architect Paul Schoeler. In 2000 the Royal Architectural Institute chose it as one of the top 500 buildings built in Canada over the last millennium. 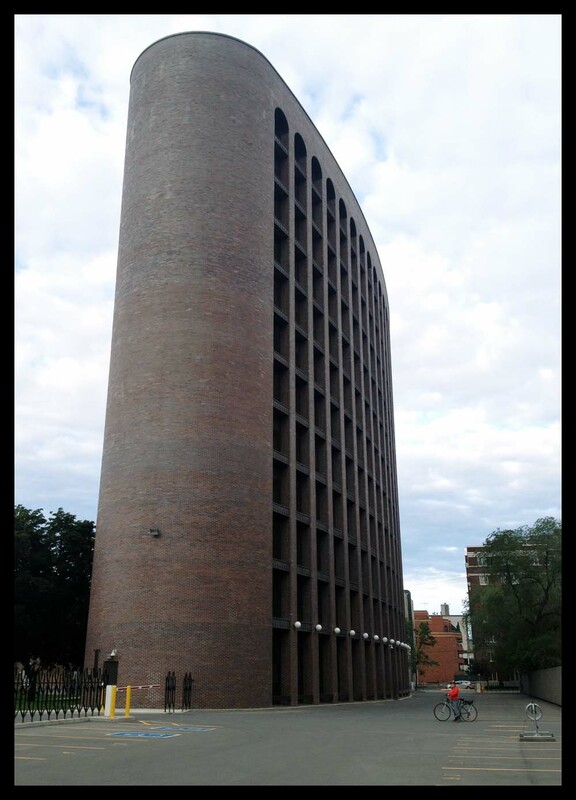 The curved forms of the outer walls are so seemingly perfect that we double checked with a folded piece of paper to make sure the brown bricks were actually flat – and they are. 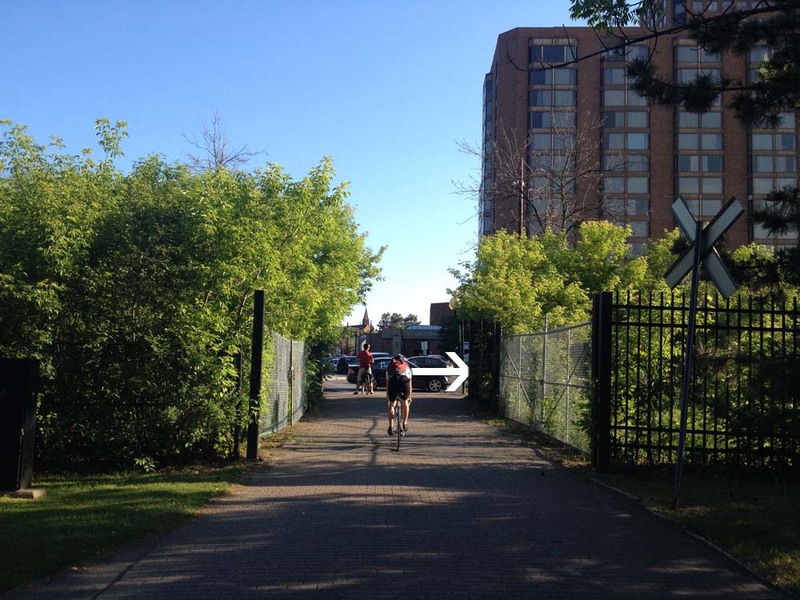 We then rode through Sandy Hill and crossed the Rideau River over the old train bridge before heading towards our final building, the Ottawa Train Station. 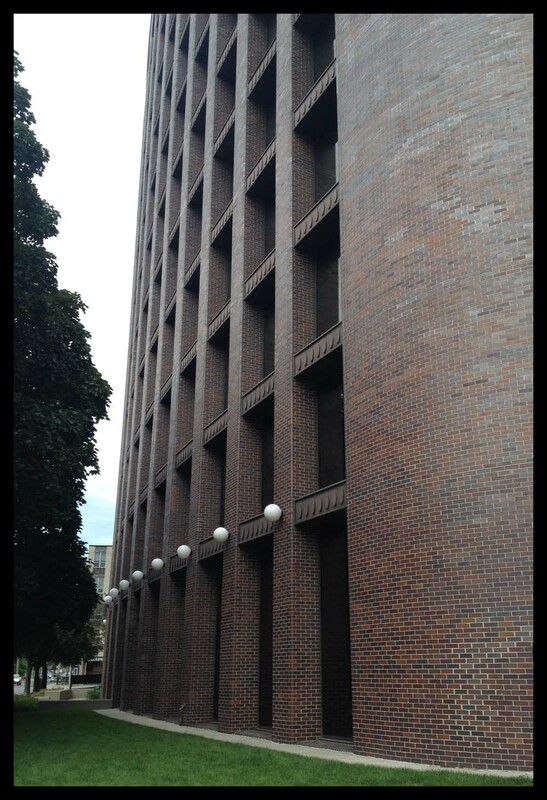 Designed by John P Parkin & Associates in 1966, it too was chosen by the Royal Architectural Institute as one of the top 500 buildings built in Canada over the last millennium. 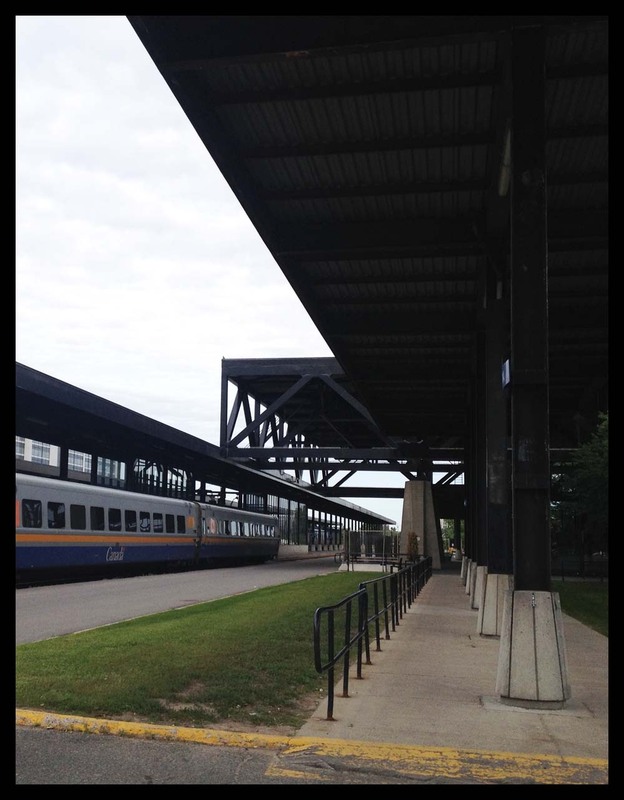 Sue likes how the dominanting truss roof structure extends right through the building, allowing for a great open space inside, as well as an extended covering at the entrance and at the opposite end between the terminal and the trains. 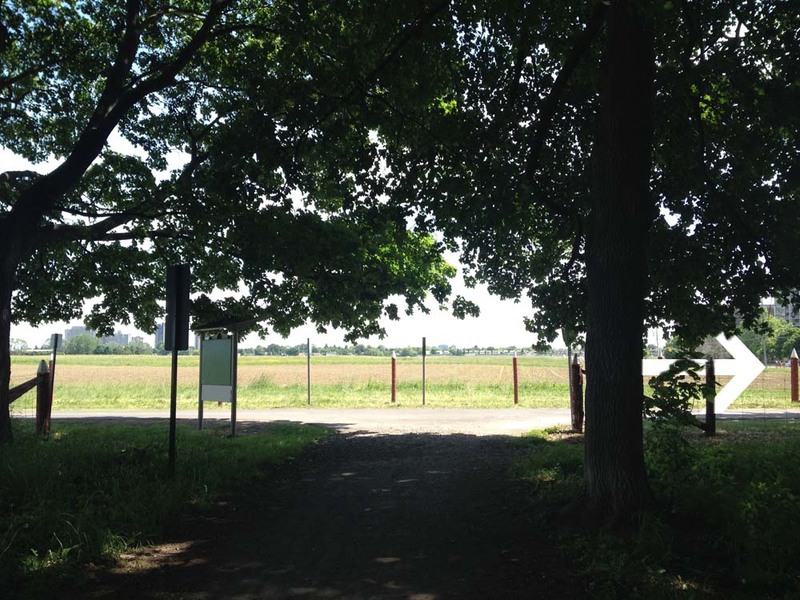 So there you go – a fine first architect inspired bike adventure! Artistic Renderings of Canines in the Capital: The Unofficial Tour, or, Places Around Town That Are Going to the Dogs! The recent solo exhibit at the Ottawa Art Gallery titled ‘Entre le chien et le loup’ by David R. Harper included two enormous stuffed wolves perched up on plinths, one all black, the other white. The title of the exhibit ‘Entre le chien et le loup’ describes the light just before nightfall, when it is difficult to distinguish a dog from a wolf. The depiction of the wolves (or were they dogs?) reminded me of other works of art throughout the national capital region that incorporate members of the canid genus, so I came up with this bike tour that visits their various locations. Our tour begins in Confederation Park across from City Hall where there is not one, but two pieces to discover. 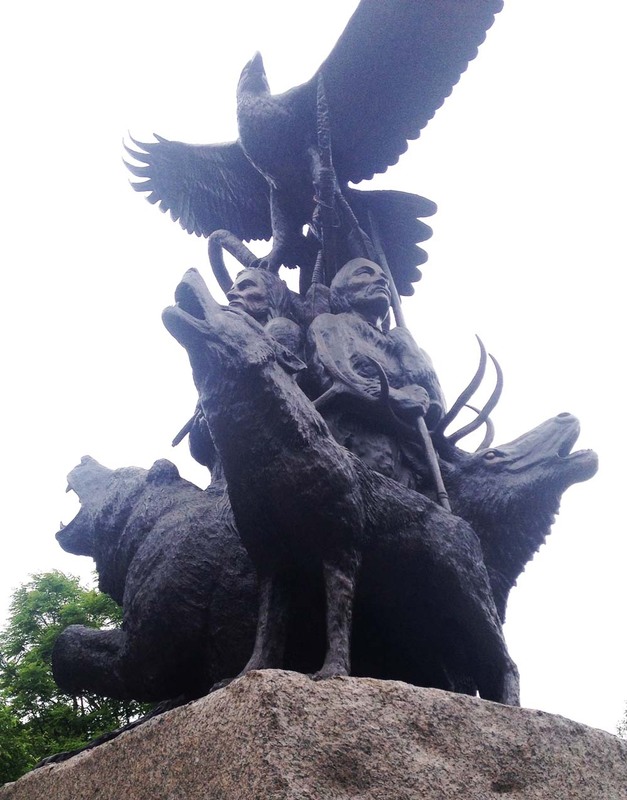 The first is a wolf incorporated into the monument commemorating aboriginal veterans, sculpted by Noel Lloyd Pinay. 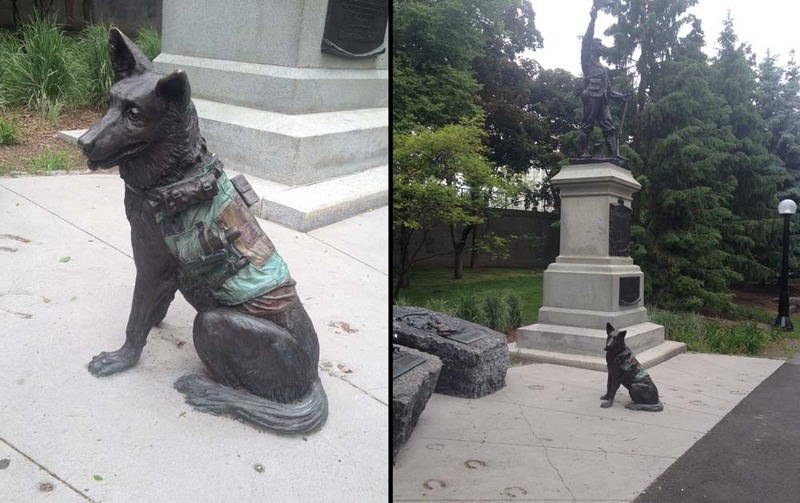 The second sculpture is a monument dedicated to animals used in war, represented in the form of a rescue dog. It is located at the base of the memorial to soldiers from Ottawa who died in the Boer War. 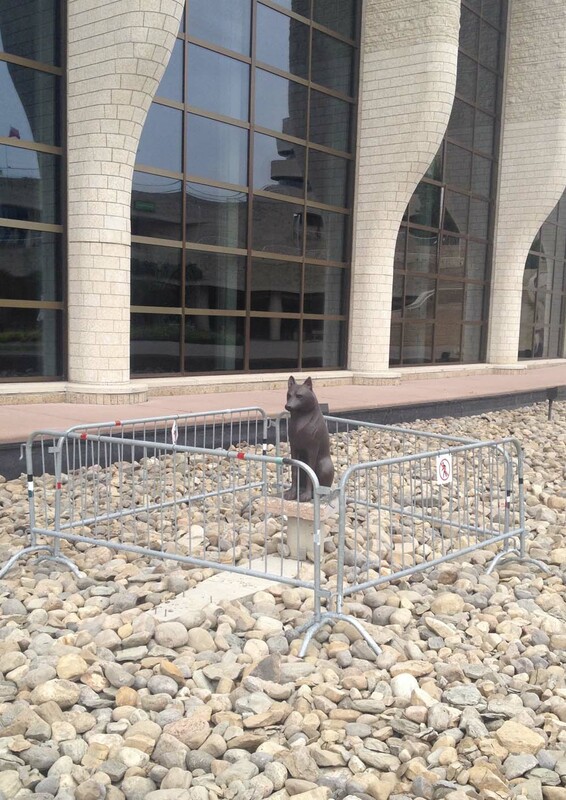 The next piece is located in Gatineau outside the Canadian Museum of History. This forlorn fellow is supposed to be sitting in a copper boat surrounded by water. It’s a sculpture called ‘Namaxsala (To Travel in a Boat Together) by sculptor Anne Barkhouse. The piece is based on a story of the artist’s grandfather bringing a wolf across a treacherous river in his boat, as described on this CMH web page. I’m guessing the boat’s being repaired for leaks, so hopefully our friend won’t be landlocked for too long. 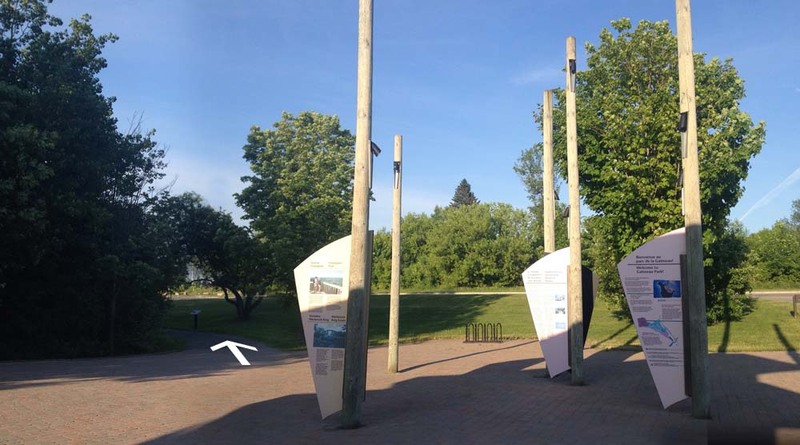 The next sculpture, titled Boat Sight by artist John McEwen, is located up river along the Voyageurs Pathway. The wolf silhouettes are cut from thick steel plate. 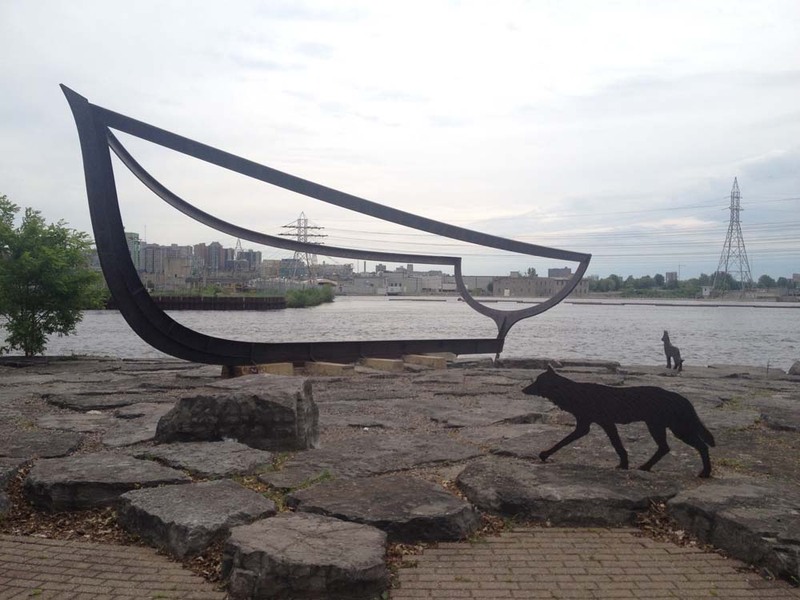 According to the accompanying interpretive plaque, the animals represent nature reacting with fear and curiosity to the presence of a large, minimalist boat frame, representing culture. Riding along the Voyageurs Pathway reminded me of one outing last year when I took this photo of a fox trotting towards me along the path, before it nonchalantly turned and wandered into the woods. The last stop on the tour is in Westboro, where there’s a painting of a dalmation included in a mural commemorating fire fighting. There are a couple of other works located further afield that incorporate canines. Both are by artist Erin Robertson in collaboration with Anna Williams. One is located at the Bellwether Longfields Transit Station, which I visited and describe in this post. Another titled Chase includes foxes, installed at the Richcraft Recreation Complex in Kanata, that I hope to ride out to visit very soon. Author ottawaveloPosted on June 13, 2014 June 26, 2014 Categories UncategorizedLeave a comment on Artistic Renderings of Canines in the Capital: The Unofficial Tour, or, Places Around Town That Are Going to the Dogs! 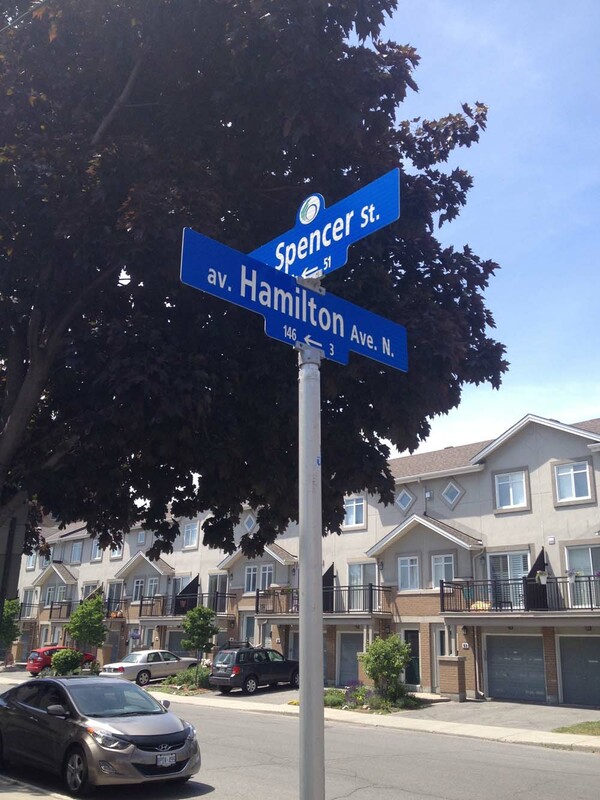 Evan enquired about a safe bike route he could take from the corner of Hamilton Ave North & Spencer Street in Hintonburg, to Merivale Road & Capilano Drive. No problemo! Here’s how. 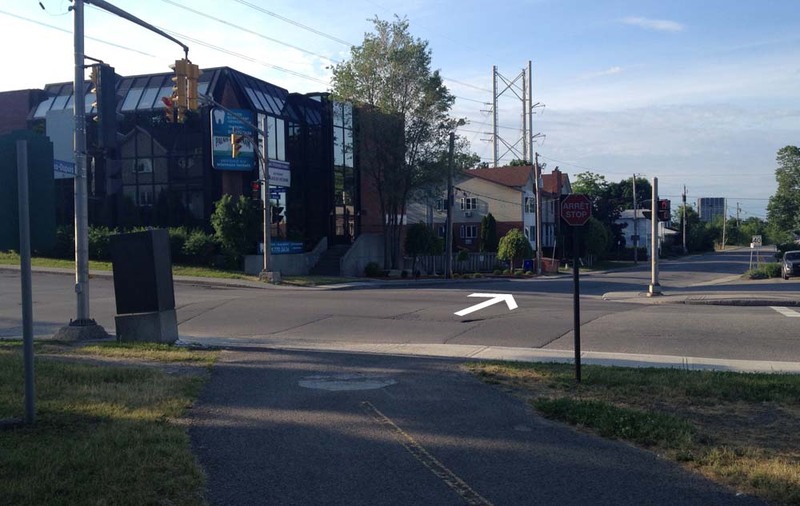 UPDATE – July 2015: Pink line is a more direct shortcut behind the Food Basics to Capilano Drive, as described at the bottom of the post. I rode east on Spencer, crossed Holland at the lights, then turned left on Caroline and headed up the hill towards Wellington. There are lights across to Harmer, which doesn’t line up precisely with Caroline, so I walked my bike 10 feet or so along the sidewalk to the lights. 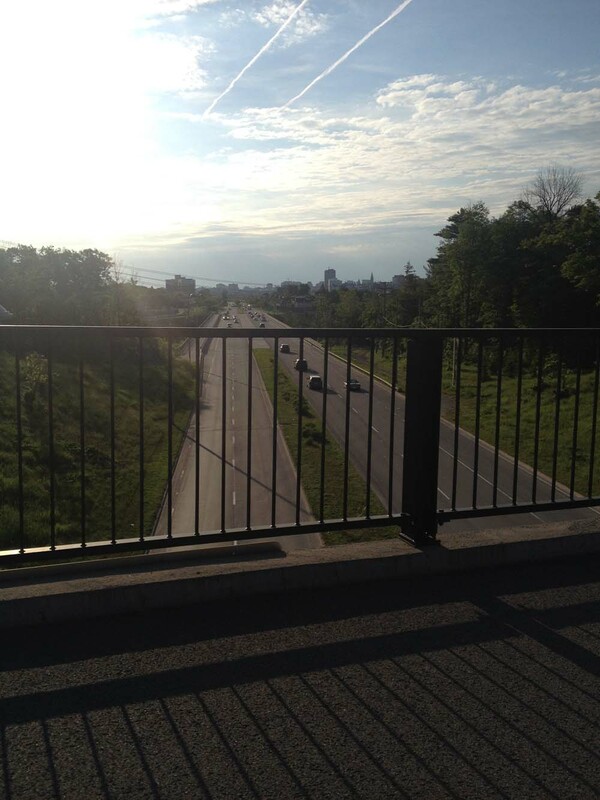 I rode up Harmer to this pedestrian bridge over the Queensway. No stairs. 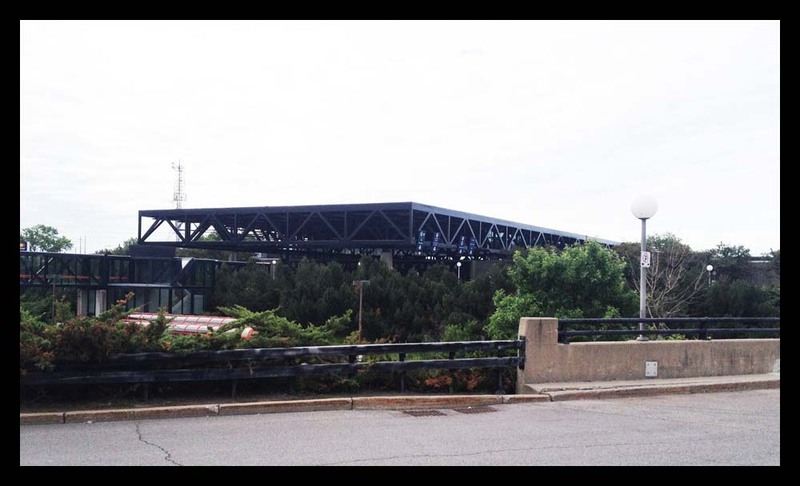 UPDATE July 29, 2018: The Harmer pedestrian bridge is no more! They ripped it down this weekend and are building a new one that won’t be ready for 2 years. 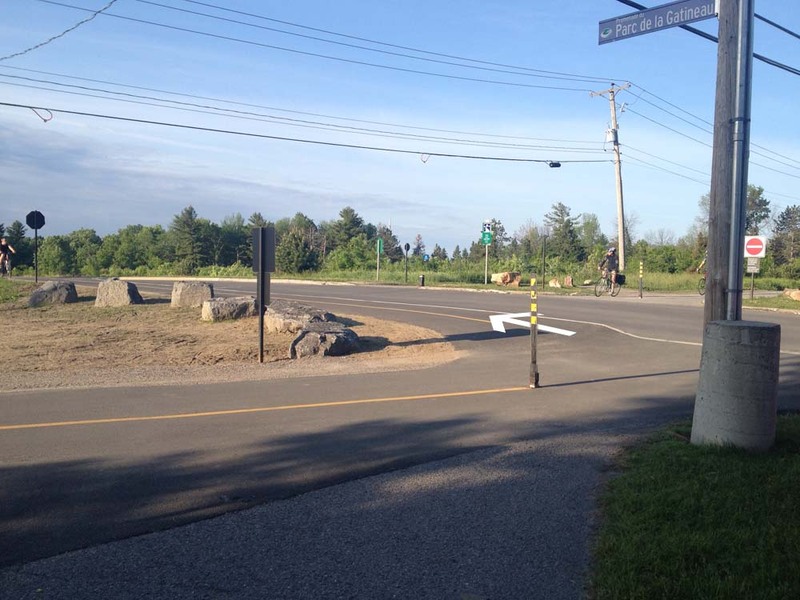 The city has installed a very controversial detour along Holland that will be fixed before the school year starts. I have adjusted the route on the above map accordingly. 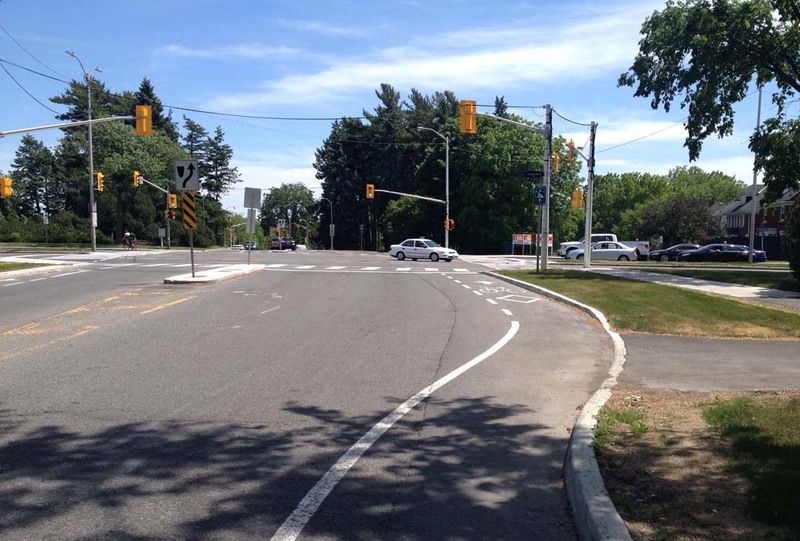 Continued along Harmer and turned left onto Island Park Drive, which has bike lanes, and followed it to the lights across Carling. I was pleased as punch to discover the path continue on the other side of Carling. I believe this link between Carling and Holland is recent. 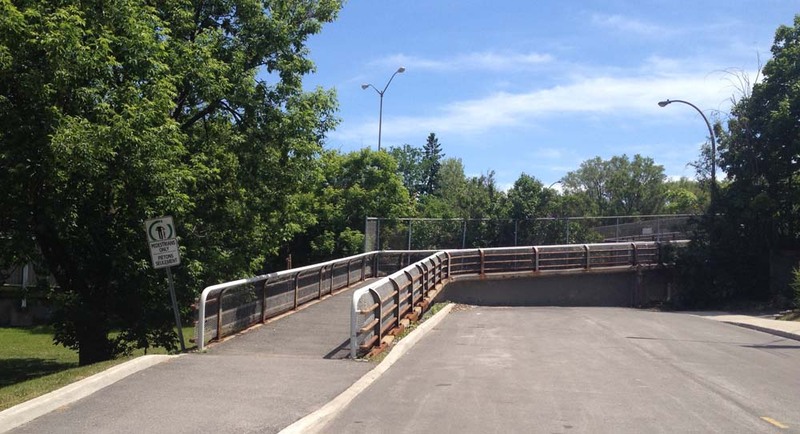 Last time I rode across I had to contend with sharing this mini-off-ramp with cars. 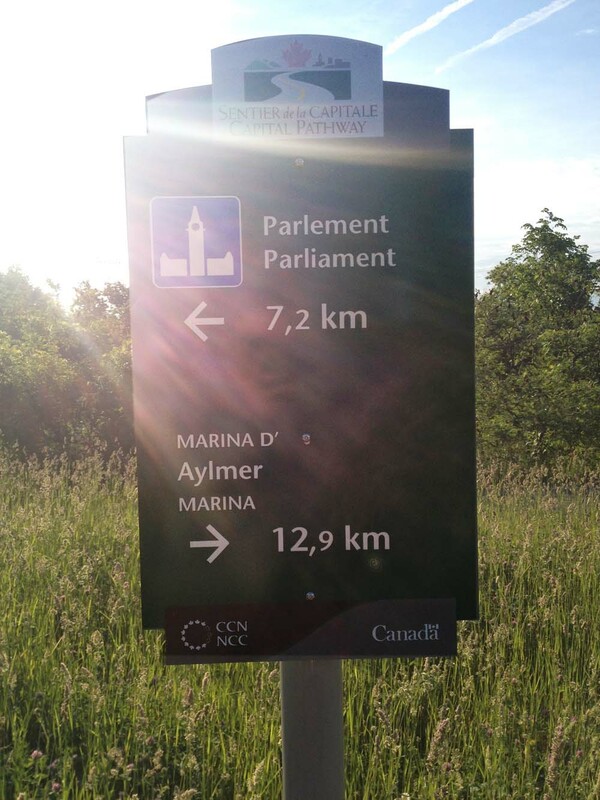 The path continues along the National Capital Commission Scenic Driveway on the other side of Holland. 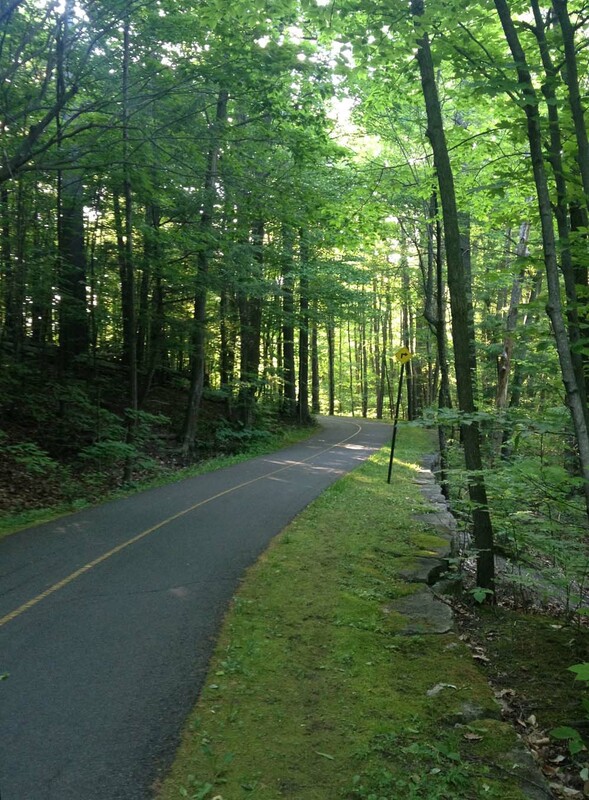 There’s a split in the path just as the Scenic Driveway veers east. I turned to the right which took me along a path through the patch of woods beside Fisher Avenue. 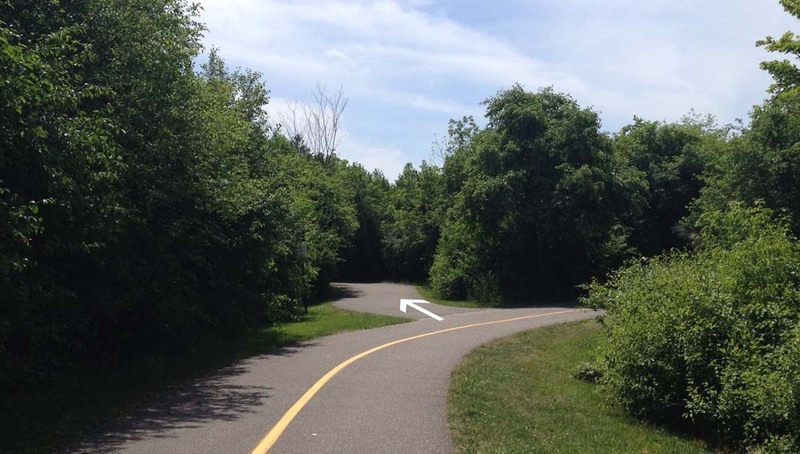 The woodsy section of path ends where it intersects the Experimental Farm Pathway. I turned right. The path follows along Fisher for a bit before coming to lights across Fisher. Things get a little convoluted here. 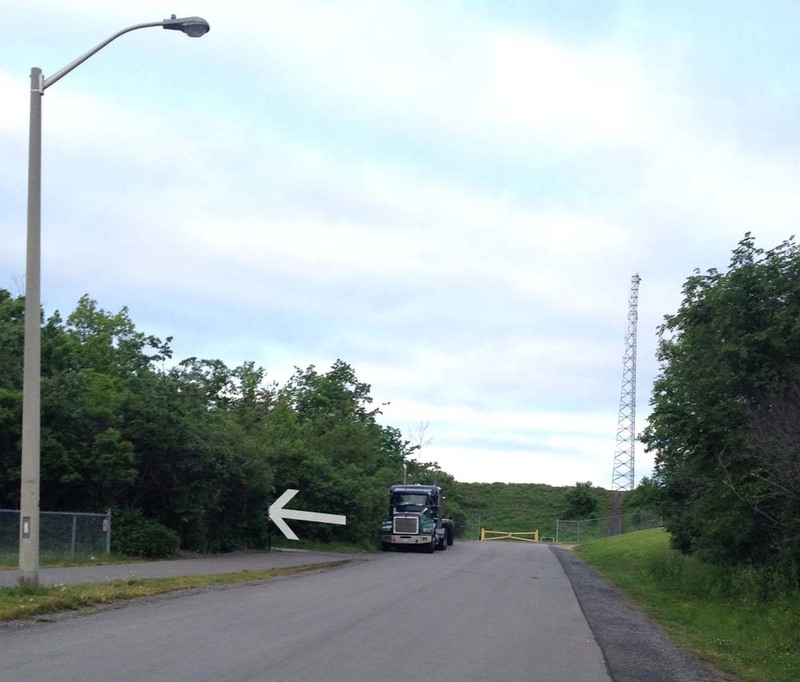 The continuation of the Experimental Pathway on the other side of Fisher is a short distance north along Fisher. It’s barely noticeable from the lights. 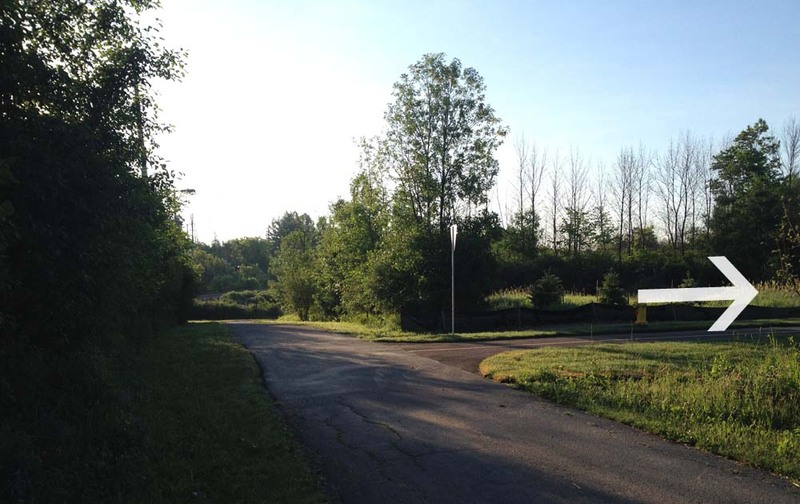 I continued along the Experimental Farm Pathway and took the left exit just before the path veers right a short distance beyond Merivale, like so. The path crosses Whtestone Drive right through to Madison Park. 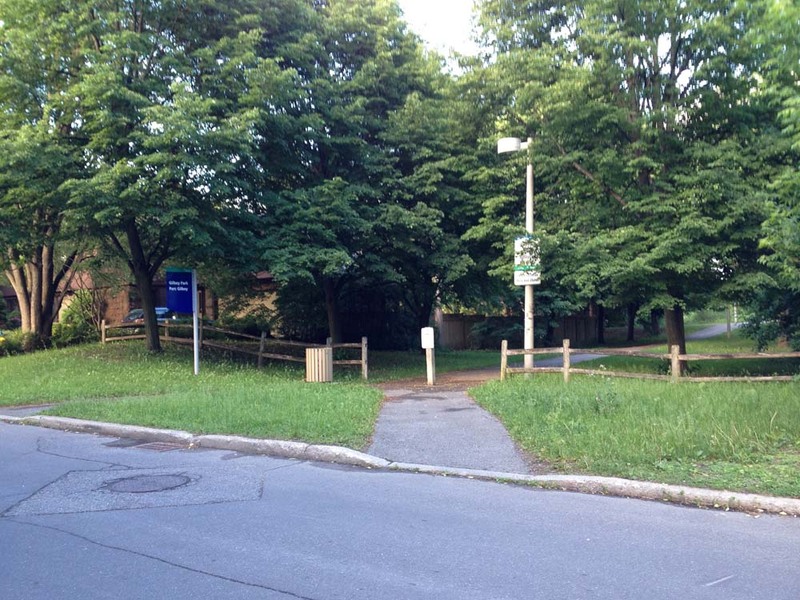 Once the path reaches Central park Drive it does a dipsy-do over to Celebration Park, like so. I stayed right on the path through Celebration Park which brought me to the other side of Central Park Drive. 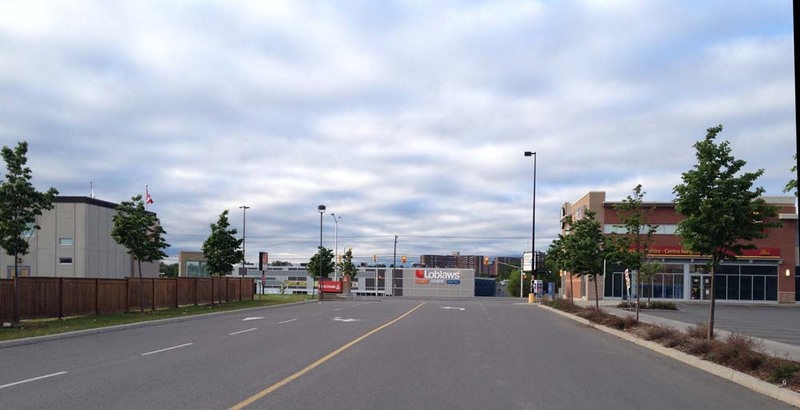 I then turned on to Scout Street and followed it to a path that cuts through to the Supercentre mall parking lot. 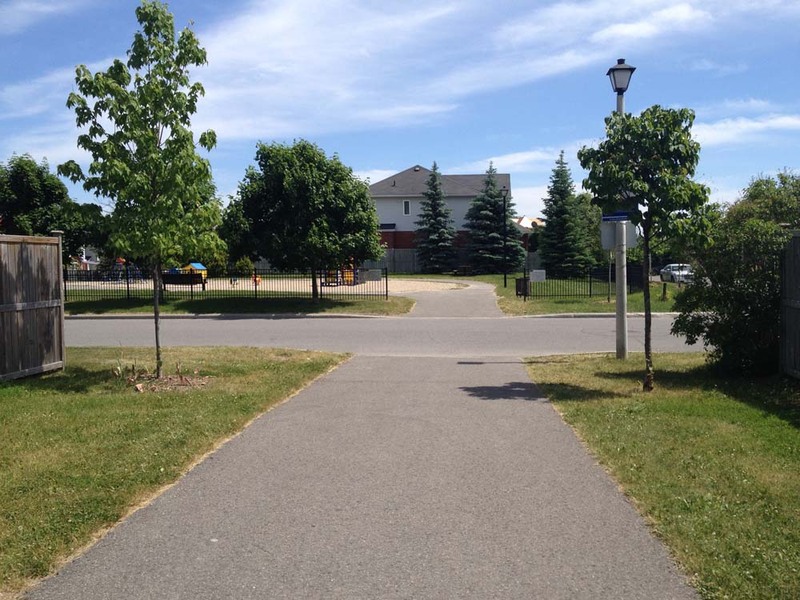 This path eventually merges into the mall entrance street that I followed to the traffic lights across Baseline. 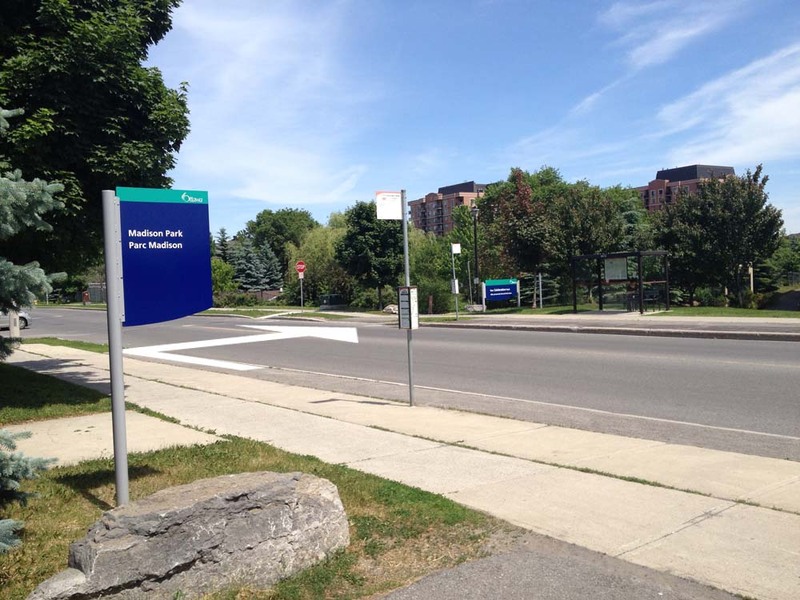 Immediately across the intersection on the north side of Baseline, there’s a short ‘desire line’ path that links to the Loblaws mall parking lot. 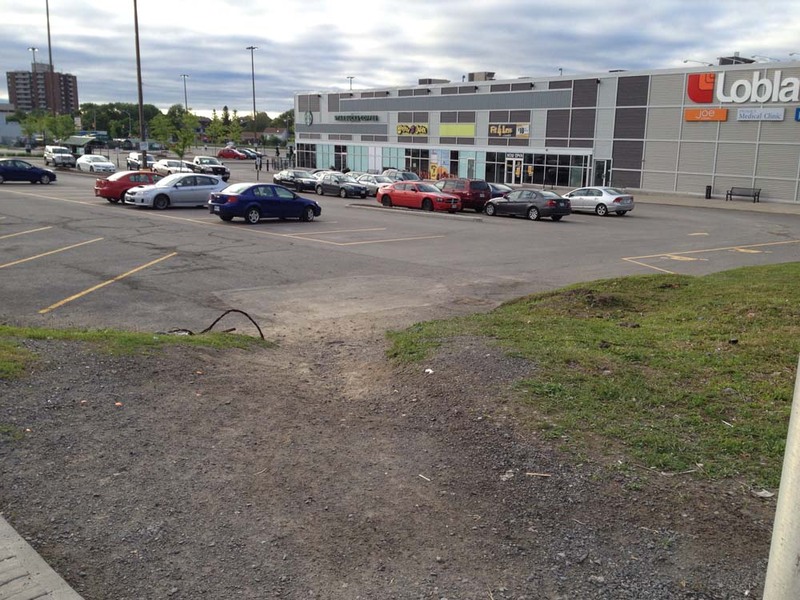 Well trodden desire line path to the Loblaw’s parking lot. 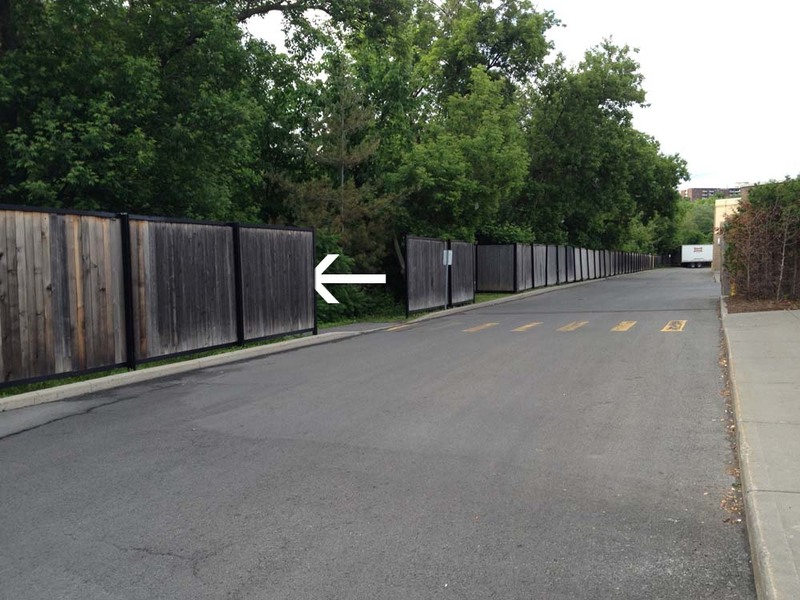 I followed a lane that goes behind the Loblaws to avoid having to ride amongst folks frantically parking their cars. This brought me around to the lights at Merivale. Once through the lights there’s a path just a short distance along that turns off to the left. This path took me to Eleanor Drive. I then worked my way up Leaver Ave to the turn off through Gilbey Park. I turned left onto Gilbey Drive on the other side of Gilbey Park which brought me to Capilano Drive. Right on Cailano brought me to Merivale. 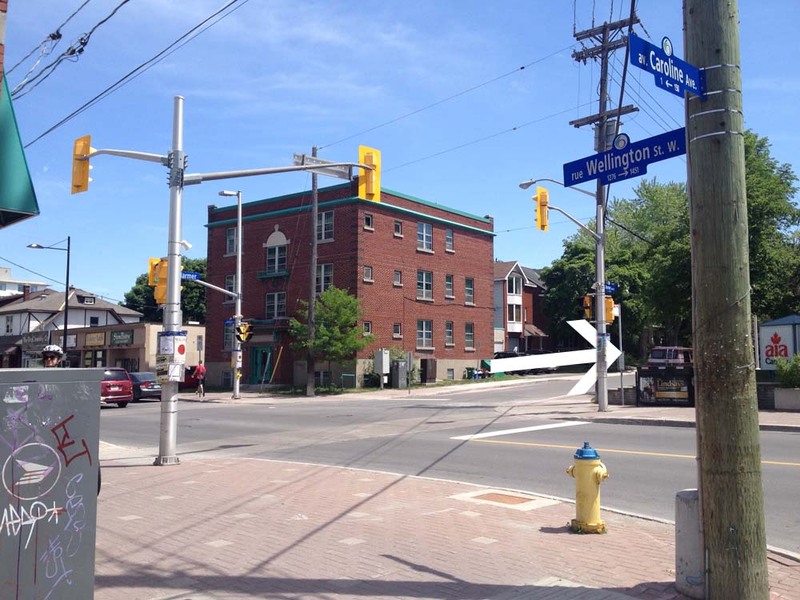 Don’t know why, but my camera switched to an old-photo filter for this shot of our final destination, the corner of Merivale and Capilano. 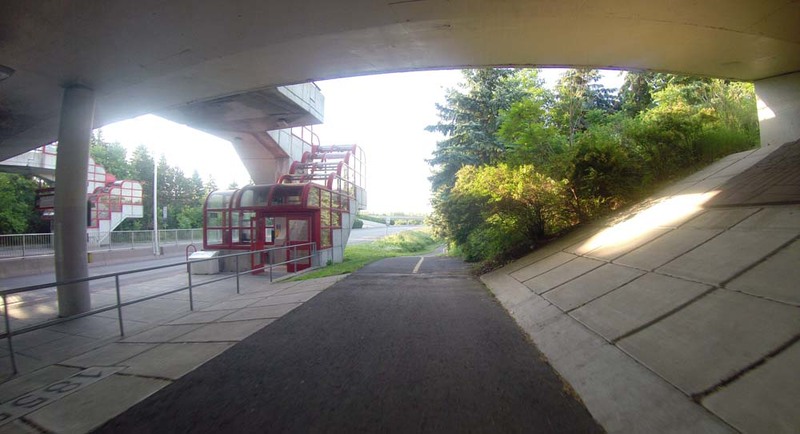 UPDATE – July 2015: There’s a more direct shortcut from behind the Food Basics to Capilano Drive, that was recommended by a cyclist who regularly rides through the neighbourhood. I’ve hi-lited it in pink on the above map. 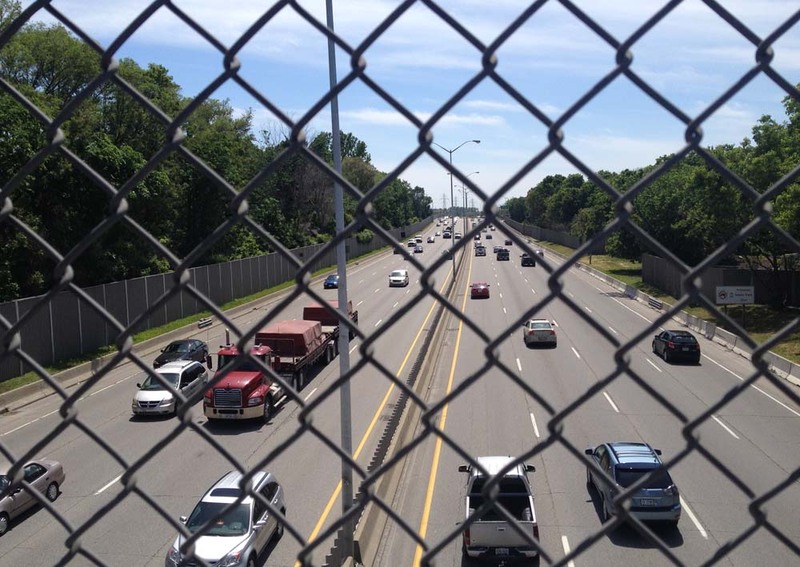 This week I learnt that finding a safe route across the three busy east-west arteries of Carling Avenue, the Queensway and Baseline Road, anywhere between Prince of Wales Drive and Pinecrest Road is a tricky endeavour. My search was spurred on by a request for suggestions on biking from Notre Dame High School in Highland Park over to Parkwood Hills. The blue line on the map below is a route with some rough spots I am comfortable biking through, however the request also needed to accommodate three travellers: one adult, one child passenger, and another child on their own bike. With two kids of my own, I would not recommend this route with bambinos in tow. But, that’s a judgement call, so I’ve included it below, with a description of the tricky spots. It’s identified by the blue line on the map. I’d suggest an adult solo dry run first. I also tried a much safer route that I would feel comfortable taking my kids, however it’s more circuitous. See red line on map below. 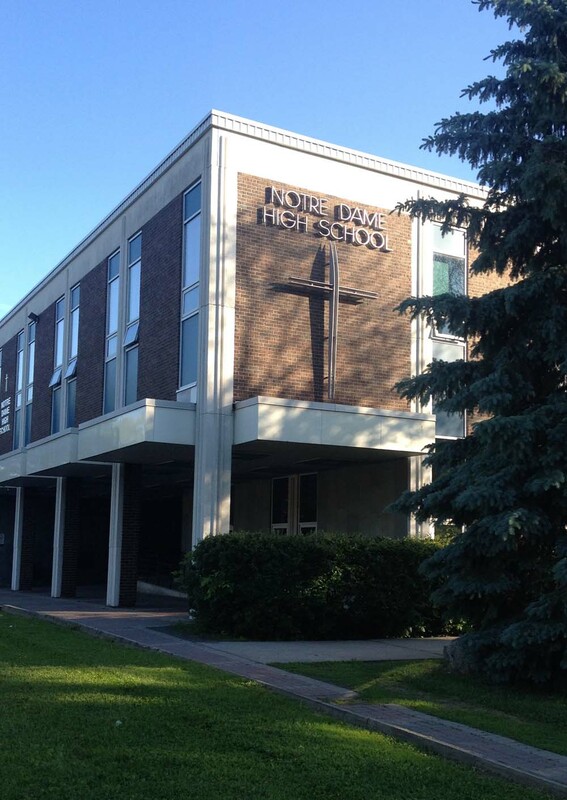 Starting point – Notre Dame High School on Broadview. 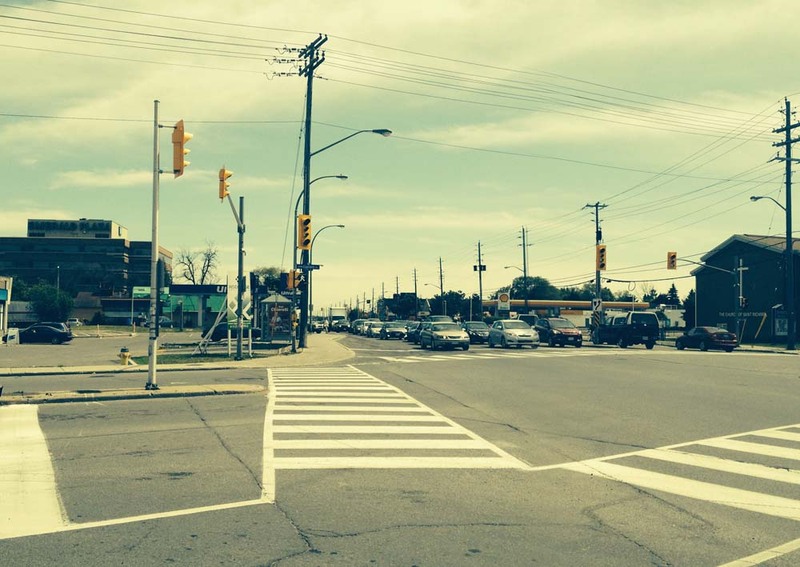 There is a crosswalk at Broadview and Carling. One major artery down. 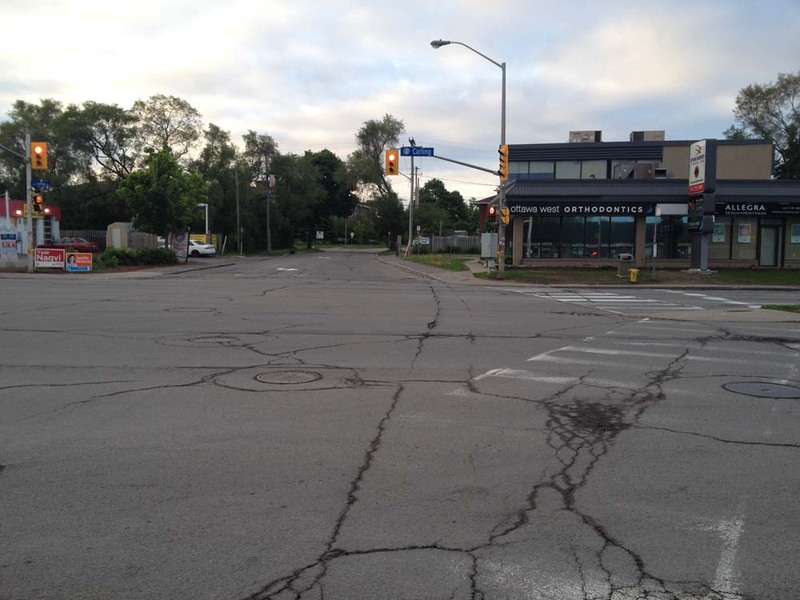 The area east of Broadview between Carling and the Queensway appears to be zoned as light industrial. The streets I followed through this area (Kerr, Boyd and Dobbie) didn’t have a lot of traffic, but there are trucks and big potholes that go with them. This is the first zone I would hesitate to ride through with my kids. 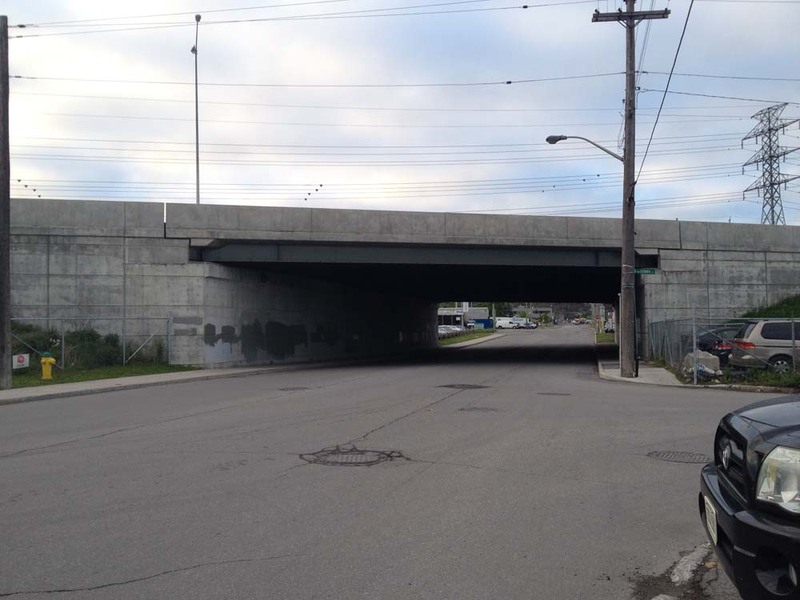 Things get a little scarier passing under the Queensway along Clyde Avenue as it is a funnel through to another industrial zone on the other side. 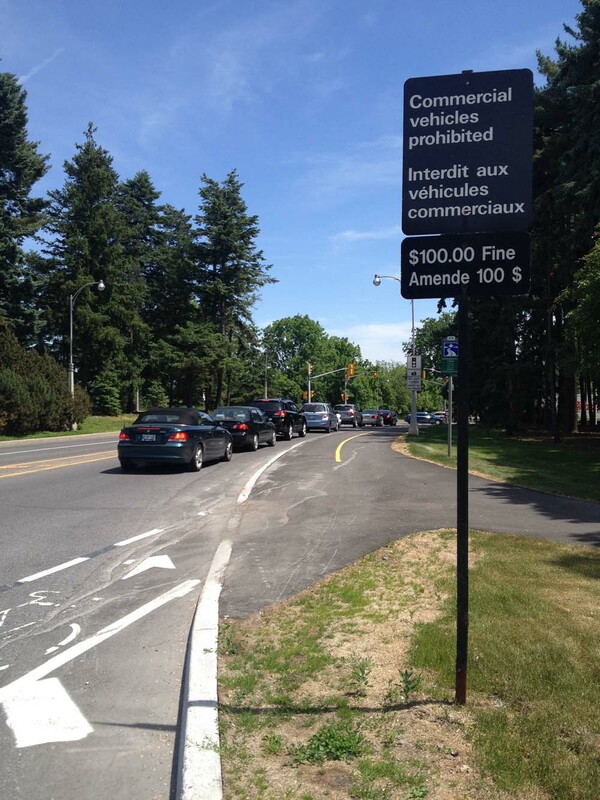 No designated shoulder and more trucks. 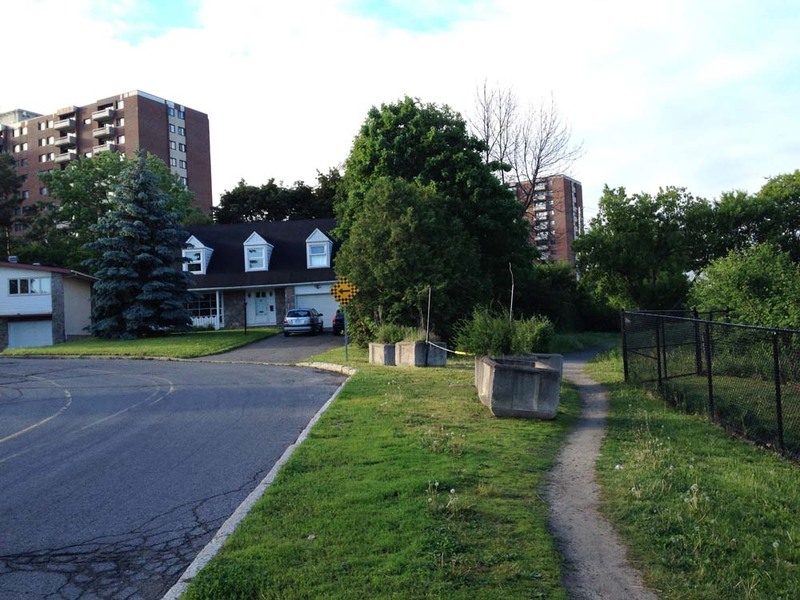 The sidewalk might be an option to consider. 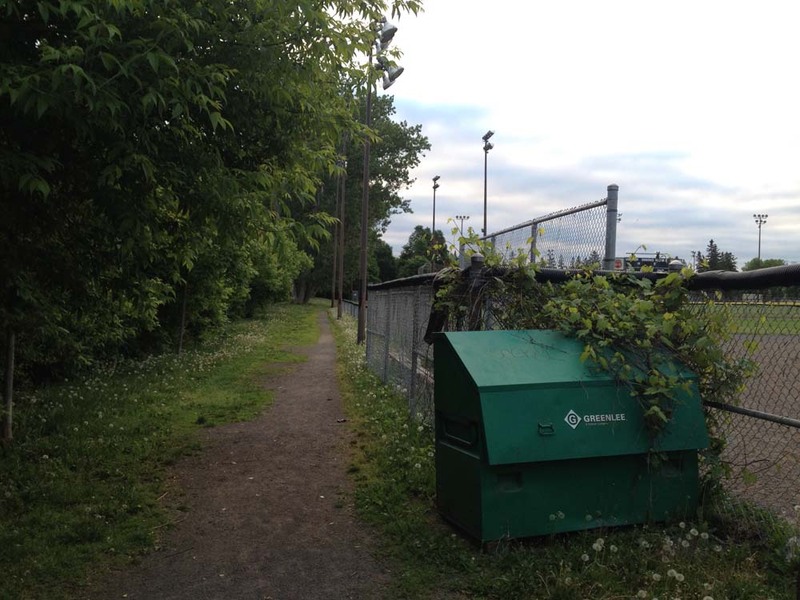 I then cut through Carlington Park by riding along the stone dust path that goes around the perimeter of the baseball field. The area east of Calington Park is mostly residential with a few small industries hugging the edge of the park. Edgecliffe Avenue is a gradual climb up to Morisset Avenue. 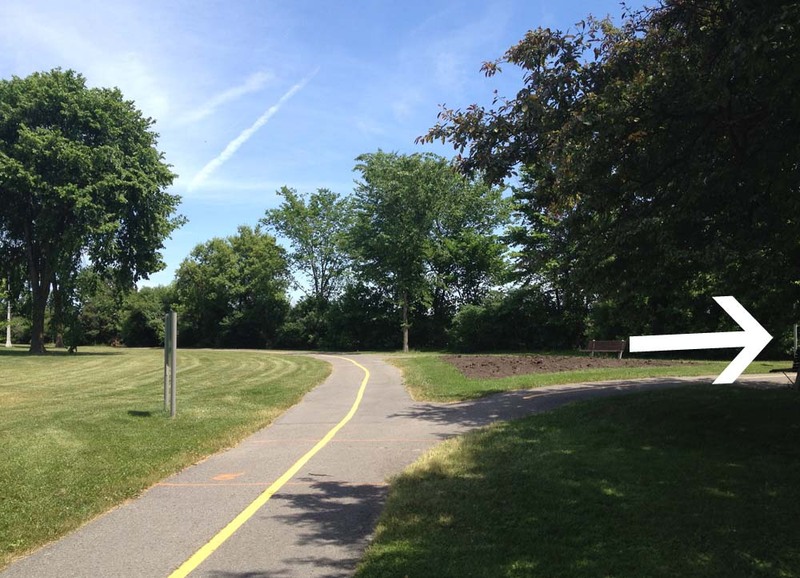 There is a link to the Experimental Farm Pathway halfway down Morisset. 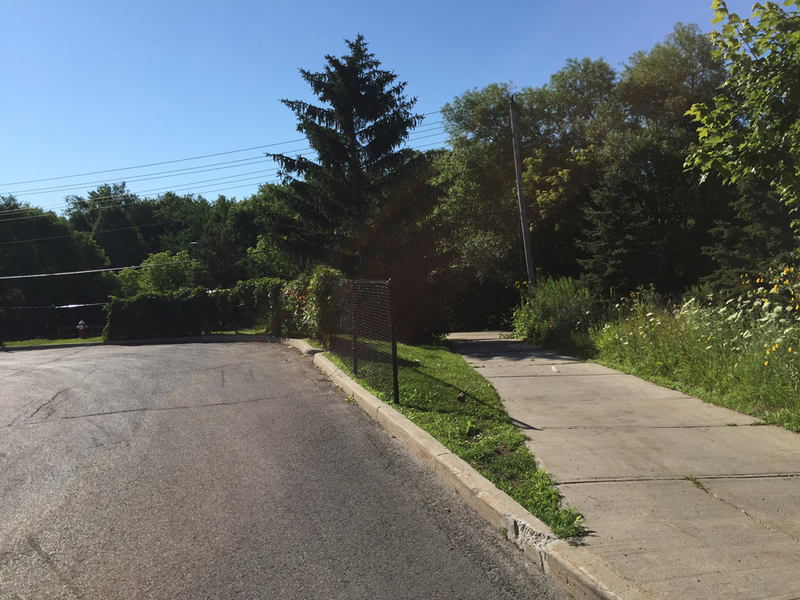 I turned left onto the Experimental Farm Pathway and followed it for a short distance through a wooded area before taking a right along a path link that goes into a residential area called Central Park. 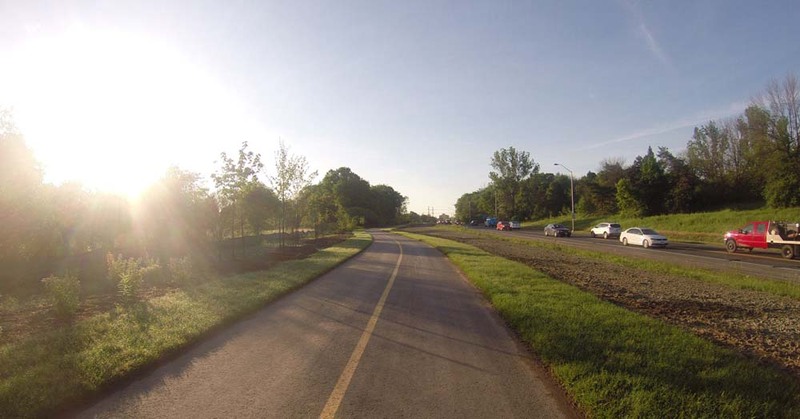 There is a bike path that cuts through from Whitestone Drive to Central park Drive, and then through Celebration Park to Central Park drive which loops around. One could also just stay on Central Park Drive. 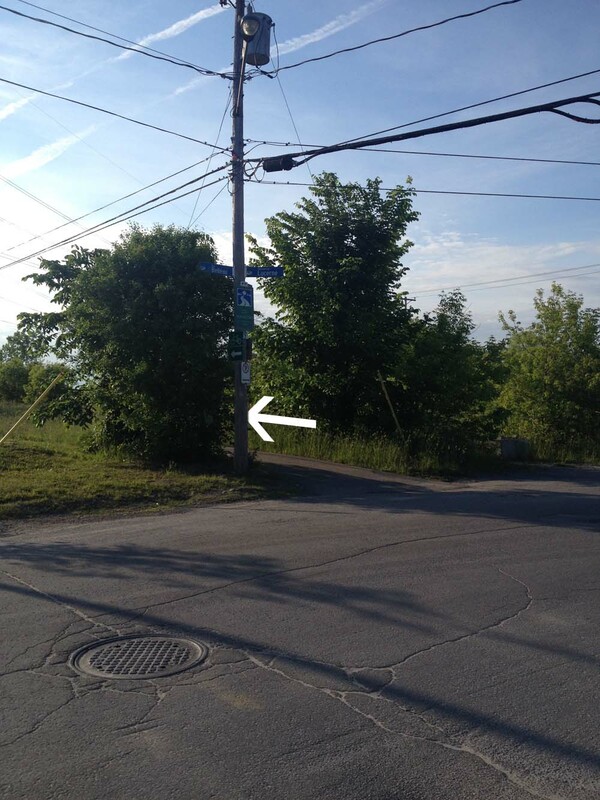 I then turned on to Scout Street and followed it to a path that cuts through to the Supercentre mall parking lot. 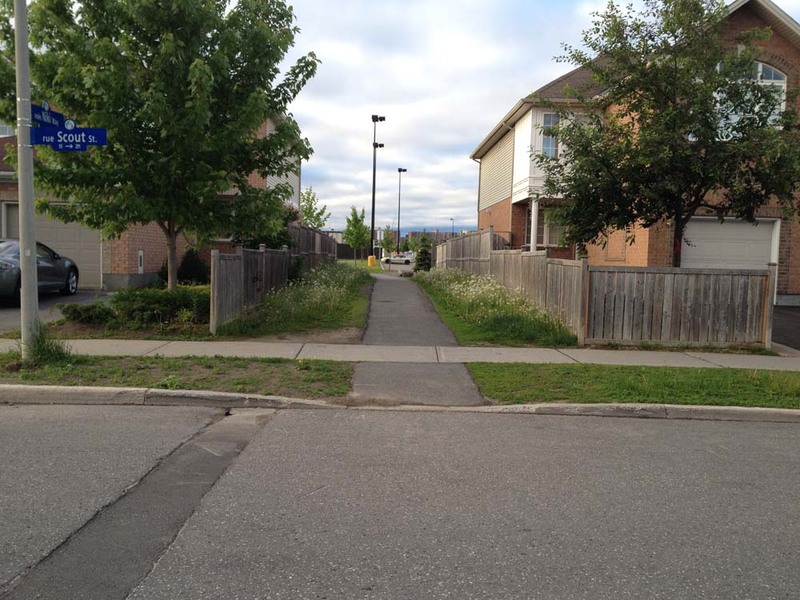 This path eventually merges into the mall entrance street that I followed to the traffic lights across Baseline. This is another area I would hesitate riding through with my kids, as drivers tend to be much less predictable in mall parking lots. This path took me to Eleanor Drive. I then worked my way up Leaver Ave and Beaver Ridge. 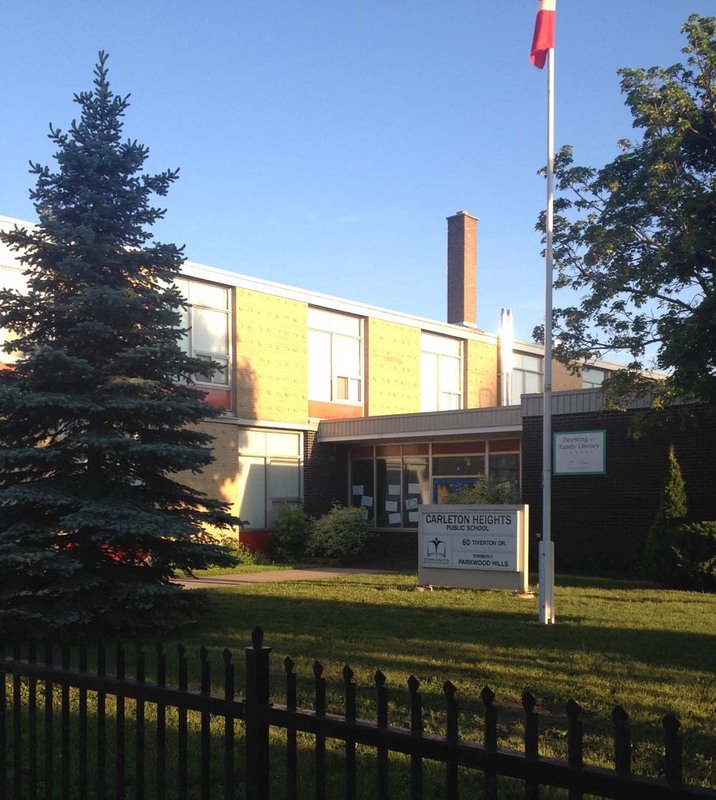 The request was from Notre Dame High School to Parkwood Hills, which I’ve taken the liberty to mean Parkwood Hills Public School. At the top of Beaver Ridge just beyond Capilano there’s a dirt path through to the small streets around Huron Towers. I followed this to avoid having to ride along Meadowlands Drive, a busy street that’s always felt dangerous to ride along, especially while it’s presently under construction. 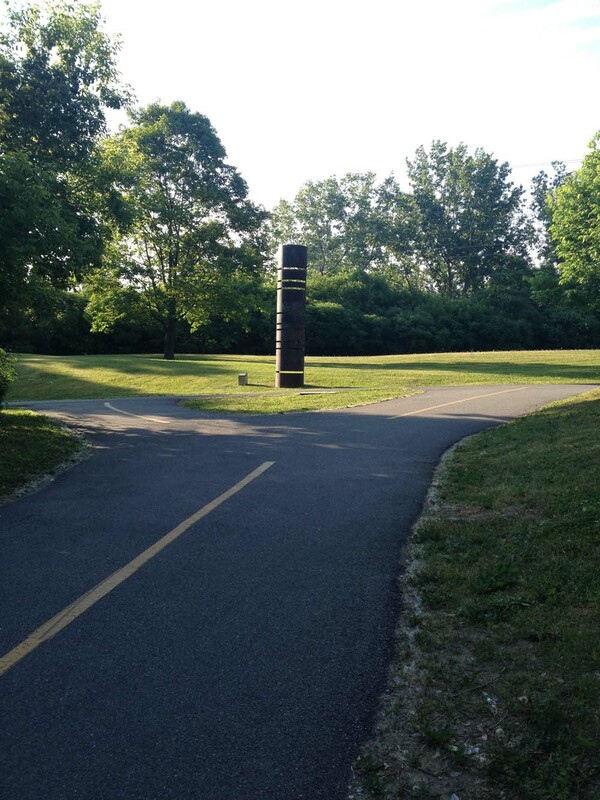 The path came to the entrance lane to the Huron Towers. 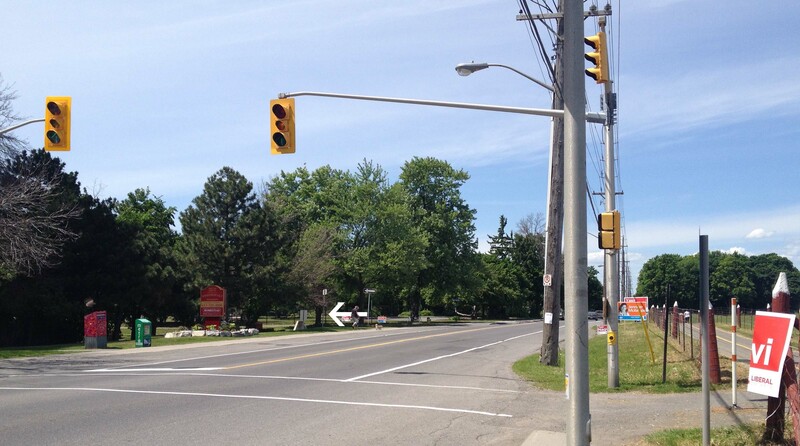 I followed it to Meadowlands where there is a cross signal to Tiverton Drive, and our destination, Parkwood Hills School.